Sit N Knit – Mon., Aug. 31 at 4 pm for knitters of all levels and ages! – Sept. 1 More information below. Conquering Clutter with Carol Seelaus – Tues., Sept. 1 at 7 pm in the 2nd Flr Community Room. Carol will share how to purge, rearrange and maintain order. Library Yoga – Wed., Sept. 2 at 10:30 am in Community Room with Theresa Landolfi. $7 per session, drop in. Friends Meeting – Sept., 3 at 12:30 pm and ‘after-meeting program’ at 1:30 pm. Marcy Abrams from Pennsylvania Citizens for Better Libraries will share info about Library Friends groups. Friends from other libraries are cordially invited! Medicare 101 – Thurs., Sept. 3 at 7 pm in the Community Room. The PA Dept of Aging created APPRISE to help Pennsylvania residents understand their Medicare and other health insurance benefits, and assist citizens in making informed decisions about their health care options. Friday Movie Matinee – Fri., Sept. 4 at 2 pm. Jakob the Liar – In 1944 Poland, a Jewish shop keeper named Jakob is summoned to ghetto headquarters after being caught out near curfew. While waiting for the German Kommondant, Jakob overhears a German radio broadcast about Russian troop movements. Stars: Robin Williams, Hannah Taylor Gordon, Eva Igo. Rating: PG-13 (violence & disturbing images) 2 hours 1 minute. Movies are free and open to the public. (Huntingdon Valley, PA) –September is Library Card Sign-up Month, a time when the Huntingdon Valley Library joins with the American Library Association and public libraries nationwide to promote the many resources, programs and services available for free in our community with one simple thing – a library card. Residents and students of Lower Moreland Township School District are invited to become library members. Students can visit to the library for materials, programs and knowledgeable library staff that support academic achievement. Teens are invited to join the Teen Reading Lounge book club, funded by the Pennsylvania Humanities Council. Students in 1st and 2nd grade are invited to our new Book Worm book club and 3rd to 5th graders can creatively explore literature in the Craft a Connection book club. Visit our table at your child’s Back to School night to join the library. It’s Free! 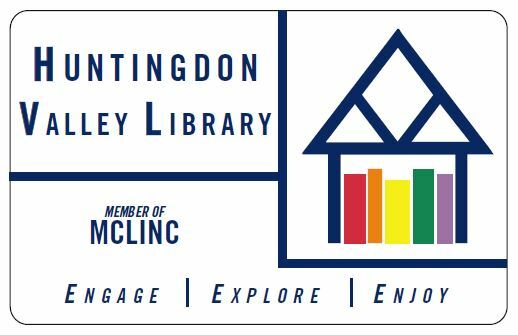 Huntingdon Valley Library isn’t only a place of quiet reading, but also a creative and engaging community center where visitors and students can collaborate, use the free wireless Internet or just relax with neighbors and peers. 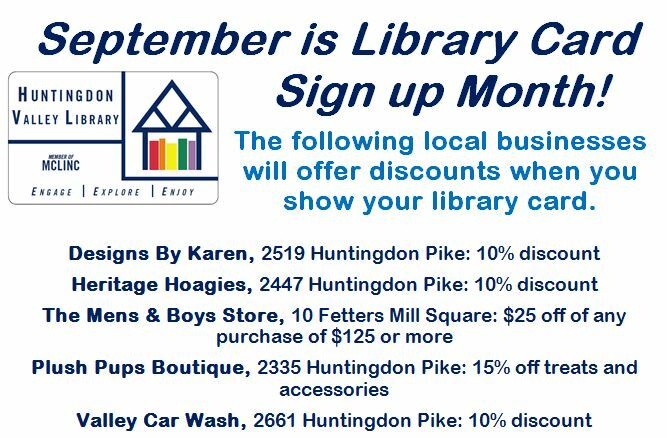 We are working with these local businesses to raise awareness of the library and encourage you to show your support of the Huntingdon Valley Library as a card-carrying member! During Library Card Sign-up Month, show your library card at these local businesses to receive a discount. It’s not too late to participate – call Pam if you are interested. 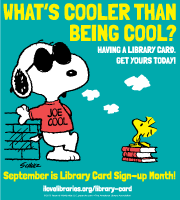 For more information on how to sign up for a library card, visit the Huntingdon Valley Library in person or visit the library online at www.hvlibrary.org. Huntingdon Valley, PA, April 1, 2015: The Huntingdon Valley Library is excited to kick off the spring with new teen events! 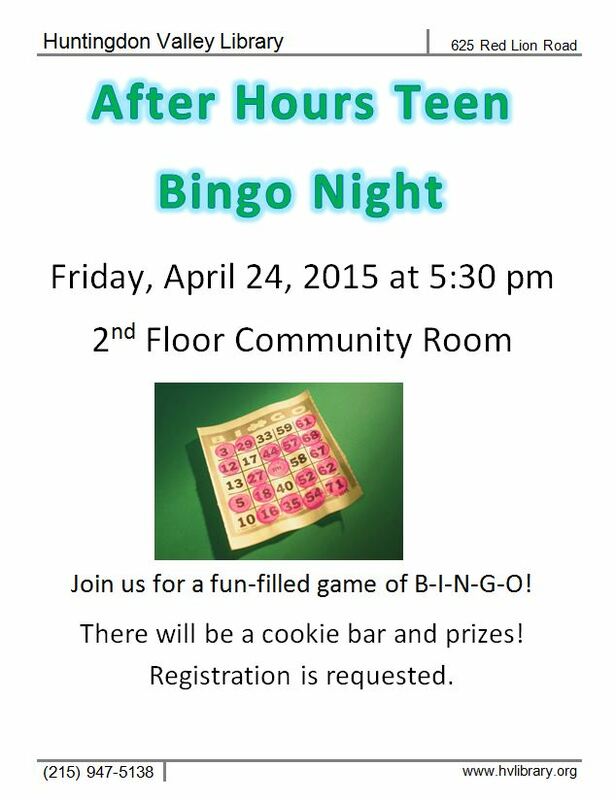 First, teens can come and enjoy After-Hours Bingo on April 24th at 5:30 pm. This event is open to teens ages 12-18, and will include a cookie bar and prizes upstairs in the 2nd Floor Community Room. Also, with so much pressure to keep up academically and socially, the Huntingdon Valley Library is offering teens the opportunity to interact in a no-stress book club that focuses on a love of literature and the humanities. Through a competitive grant from the Pennsylvania Humanities Council, the Library is excited to host Teen Reading Lounge, an interactive book club designed exclusively for teens ages 14-18. The Library chose Henna House, a coming-of-age story by local author Nomi Eve, as the program’s featured book. Teens who attend the program will receive a free copy. On April 15th from 6:30-8:30 pm, the Library will host a book discussion about Henna House, and the teens will have the opportunity to make dream catchers. On April 22nd from 7-9 pm, teens will participate in a creative workshop where they will MEET AUTHOR Nomi Eve, as well as have to opportunity to experience henna applied by a professional henna artist. On May 27th from 6:30-8:30 pm, the Library will host a workshop about dreams and their role in literature, and will feature guest speaker Ken Kaplan. The Teen Reading Lounge is open to all teens ages 14-18. No special knowledge is required to participate. Refreshments will be served. To register and pick up a free copy of the book, please contact the Library at 215-947-5138. Teen Reading Lounge was created for public libraries by the Pennsylvania Humanities Council to encourage teens – the next generation of Pennsylvania’s library community – to read and talk about literature that matters to them. Through informal book discussion and individual projects, libraries foster creativity in teens and expand on critical thinking skills learned in the classroom. In addition, teens learn to value the role their library plays in offering fun, relevant programs. This program is funded by the Department of Education’s Office of Commonwealth Libraries.